You don’t have to speak French fluently to join Friends of Marcq – our members are enthusiastic about communicating in French but have varied levels of ability. However if you want to improve your language skills you should join one of the French classes in Ealing run for Friends of Marcq members. These are held under the expert tuition of Michelle Pickard, a native French speaker with many years’ experience of teaching adults. We are considering reintroducing the Wednesday morning intermediate class, and you can be put on a waiting list until its resumption this autumn. Our classes focus on practising the language in class, with a variety of tasks aimed at exploring new vocabulary and reinforcing learners’ grammar and oral skills. Activities include oral and aural tasks, translation, team working and mini research projects on diverse French topics. Between classes, some work needs to be done at home, to reinforce learning. The year is divided into three terms of around 11-12 weeks each, with weekday classes that last for 2 hours. Payment is in advance but on a rolling basis: there is no financial penalty for missing a class. NB Currently we do not teach Beginner’s level French language, but there are opportunities available at Beginner’s level to get started at local colleges; for example Hammersmith and Fulham Adult Learning College, King Street Hammersmith http://www.hfals.co.uk/, has a range of French Beginners’ classes. For more information on our classes, contact Yvonne Little on 020 8567 2955. 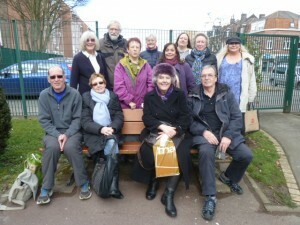 In addition to French classes in Ealing, there is also a “stage intensif” held in Marcq every year, usually in March. Participants stay with local families and attend classes on three days of the four-day long weekend. As well as socialising with their hosts, there is a final evening of celebrations for course participants and members of Les Amis d’Ealing. Similarly, again usually in March and two weeks apart from the “stage intensif”, French participants in the Intensive English weekend are hosted by Friends of Marcq members in London. In this way close friendships have developed over the years between members of the two associations.